A Prison Bus in The Lost and Damned. 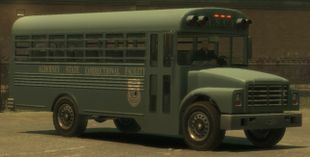 The Prison Bus is a bus in The Lost and Damned and Grand Theft Auto V.
The Prison Bus is very different to the normal Bus as it is shorter and more heavily armored for prison-mate transportation and protection for the Alderney State Correctional Facility. The bus' design is comparable to that of a typical 1950s American school bus, but features barred windows intended to keep transported inmates inside. The cowl (hood) design is based on the International Harvester S-Series, although lacking its distinctive power bulge. The headlights and grille bear a loose resemblance to the Chevrolet Kodiak. As for the bus body, the design is loosely based on the Blue Bird CV200 body. The Lost and Damned (Rear quarter view). The Prison Bus performs much better than the Bus due to its shorter wheelbase and lighter construction. It has very soft suspension and steering for a vehicle of its class, but given it is an armored vehicle it suffers from poor acceleration, although it can achieve a considerably good top speed of 145 km/h (90 mph). Its still heavy weight also allows for the ability to push aside smaller vehicles with ease. The Prison Bus also features four wheel drive, which makes it a good performer offroad and on rough uneven terrain. The Prison Bus prominently appears in the mission "Off Route" where the player must hijack it full of inmates, lose a three-star wanted level and then drive it down to Acter Industrial Park, after which it is pushed into the ocean when the inmates have disembarked; during the mission, this bus is depicted to be impervious to damage. The bus can also be seen in the mission "Get Lost" when it can be found parked at the Alderney State Correctional Facility parking lot as the player breaks in and breaks out. There is only one way to obtain this vehicle; the player must park the vehicle at a safehouse parking lot, move a safe distance away, and then kill themselves. The overhead red lights in the front and back appear to be non functional, even lacking internal reflectors and light bulbs. Although the bus is seen to hold a maximum of seven occupants (a driver and six passengers) in "Off Route", the bus is only capable of carrying four occupants outside the mission, similar to the Bus. The bus' rear emergency door can in fact be opened or detached by force through violent crashes, but cannot be accessed. This page was last modified on 21 December 2013, at 00:49.